The Coolpix L26 offers one-touch 720p video recording. Nikon has announced three new compact cameras aimed at inexperienced photographers. The Coolpix L25 and Coolpix L26 will be released mid February, while the Argos-exclusive Coolpix S2600 is on sale now. First up, the sub-£70 Nikon Coolpix L25, a 10MP camera with a 5x wide-angle zoom. The L25 is powered by AA batteries and offers a selection of straightforward auto modes designed to appeal to casual snappers. Easy Auto mode matches all camera settings to the available lighting, while its Smart Portrait System combines features such as Smile Timer and Skin Softening. Other notable features include electronic Vibration Reduction (VR) and Motion Detection, plus a 3-inch LCD for reviewing pictures and video. At £30 more than the L25, the £100 Nikon Coolpix L26 offers a slightly enhanced feature set, albeit one still targeted at first-time photographers. The 16-megapixel L26 boasts and Nikkor 5x wide zoom, Easy Auto Mode and one-touch 720p HD video recording. Photos and movies can be uploaded straight to a phone or computer for easy sharing with family and friends, too. Available in the UK through Argos, the Nikon Coolpix S2600 is a slim compact with a Nikkor 5x wide-angle zoom. The 14-megapixel sensor is housed in a body that's only 19.5mm thin. Automatic features include Easy Auto mode and Scene Auto Selector, which sets the optimum Scene mode according to the conditions. Four types of anti-blur technology, including electronic VR, are employed to reduce the chances of blurred images, while a retouch menu enables you to enhance images post-capture. 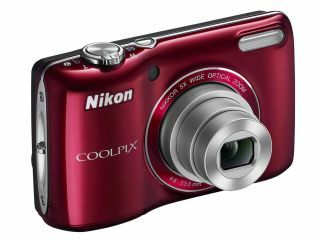 The Nikon Coolpix L25 UK release date is 16 February, it is priced at £69.99 and available in silver, black, red and white. The Nikon Coolpix L26 UK release date is also 16 February and it is priced at £99.99 and will also be available in the same four colours. Finally, the Nikon Coolpix S2600 UK price is around £69.99 and it is available now from Argos. It comes in three styles: black, red and purple with line art.